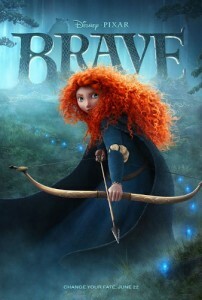 Disney Pixar’s Brave Movie Review! One of the “perks” of being a blogger is that I have the opportunity to attend movie screenings, and may times I am able to take my kids with me. 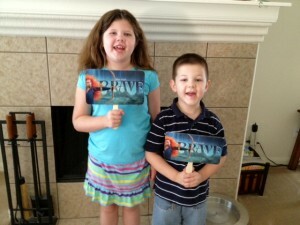 We got the screening notice for Brave several weeks ago and my kids and I have both been looking forward to seeing it. We were not disappointed! Merida is a young lady torn between her love of adventure and her responsibilities as a princess. Faced with the prospect of marriage, which she feels she is not ready for, she decides to take matters into her own hands to try to change her fate and seek her freedom. She happens upon a witch who casts a spell to help “change her mother” but of course, things don’t go quite as planned. She must mend her relationship with her mother given unexpected challenges. One of the things that he shared was that the movie was based on Brenda Chapman’s own experiences as a parent of a six year old daughter. She pitched the idea after trying to envision what her daughter would be like as a teenager! He is also the parent of a pre-teenage daughter and three boys, so he said he based some of the antics on his own experiences as a parent! I’m the parent of an often spirited daughter (who I have been told is just like I was at her age, of course), and I have often found myself wondering about what she will be like as a teenager. I was also reminded of my relationship with my own mother during the teen years! Parents will enjoy this movie because in one way or another, they can relate to the story line either because of the difficulties associated with parenting a teenage daughter or because of the trials that come with raising busy little boys! Kids love the antics of the three little brothers as well as the action and adventure and Merida’s bravery. This is not your typical “princess fairytale” though, and I will warn you that some of the action scenes, which involve fighting scenes with bears, were a bit intense for my five year old, who ended up on my lap more than once during the movie. Overall, we loved the movie and I think it had a great message! Mark Andrews summed it up best when he said that it deals with both the external tasks that we associate with bravery, but also the internal task of bravery, which is being able to recognize your mistakes, admit to them, and do everything you can to make them right. NOTE: I did not receive any monetary compensation for this review. I was allowed to attend an advance screening for free. All opinions shared are my own and were not influenced in any way.